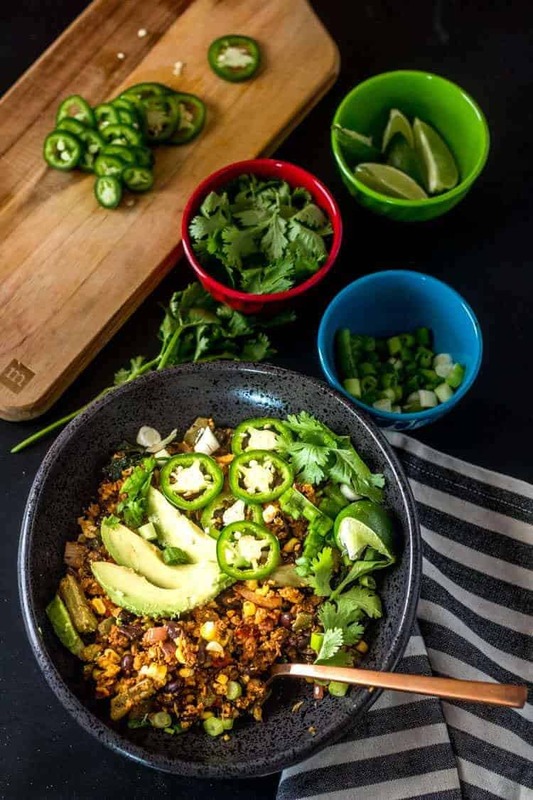 Whether you’re following a restricted “diet” or not, you’re going to love this zesty low carb Mexican-style meal-in-a-bowl. It is my hope that you’ll use this recipe/post as a template, and make it your own! Cauliflower rice is HOT. Pun intended. 😀 It’s become a favorite substitute for white rice in all kinds of dishes! When I first decided to “play” with it, I grated it (bad idea), and cooked it in a sauté pan on my induction cooktop. 1. Grating cauliflower takes FOREVER! 2. The moisture in the cauliflower gets released into the pan, and the resulting “rice” resembles a steamed or boiled vegetable. YUCK. Needless to say, I wasn’t thrilled with the results. 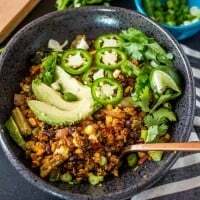 When I started working on Low Carb Mexican Cauliflower “Rice” Bowls, I considered how I might achieve a bit of maillard reaction with the cauliflower grains. High heat on the stove will work, but only if excess moisture is removed. I prefer the results of roasting the cauliflower grains. To achieve a consistent size and shape, I highly recommend using a food processor. Don’t crowd the bowl! I have a Cuisinart 7 cup processor, and complete the process in 3 batches. The grains get spread out on a baking sheet, get a drizzle of olive oil, and then a sprinkling of sea salt and fresh ground pepper. They get some really nice caramelization in about 20 minutes at 400° (375° convection roast). Remember to stir occasionally… Your rice can go from perfection to crispy-critters in short order! In the meantime… Let’s get to work on the rest of the dish! As I suggested, this is a very customizable dish. If you’re vegan/vegetarian, beans add protein, but you can also add some tofu. Black beans and tofu work well together IMHO. I love chaya, and can almost always get it at our local farmers market. You may remember way back when, I did a Mexican Fried Rice With Chaya and Ground Pork? I haven’t spent much time focusing on this amazing ingredient due to its lack of availability in most markets. Chaya (aka Mexican tree spinach) is a large shrub native to Mexico’s Yucatan peninsula, but it grows really well in the Rio Grande Valley. For more about chaya, see Mexican Fried Rice With Chaya and Ground Pork. My suggested substitute would be kale. This is a quick stir-fried dish, so I would suggested steaming or parboiling the kale prior to adding it into the sauté pan or wok. I have also included nopales (cactus pads). Again, this is very much a regional ingredient. 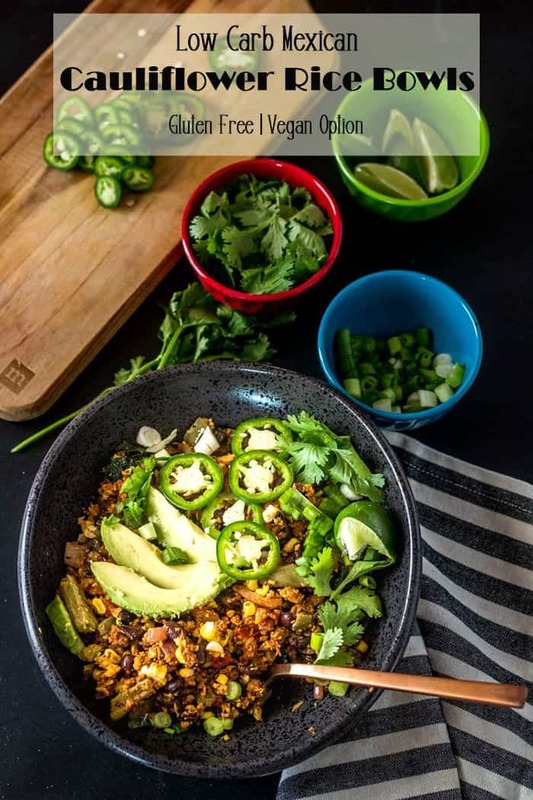 (See my Vegetarian Tostadas with Black Beans and Nopalitos, High Protein Vegan Breakfast Burritos, and my Nopalitos and Red Chile Rice Bowls). Substitute Hatch green chile, roasted poblanos or Anaheims, or even piquillo peppers. 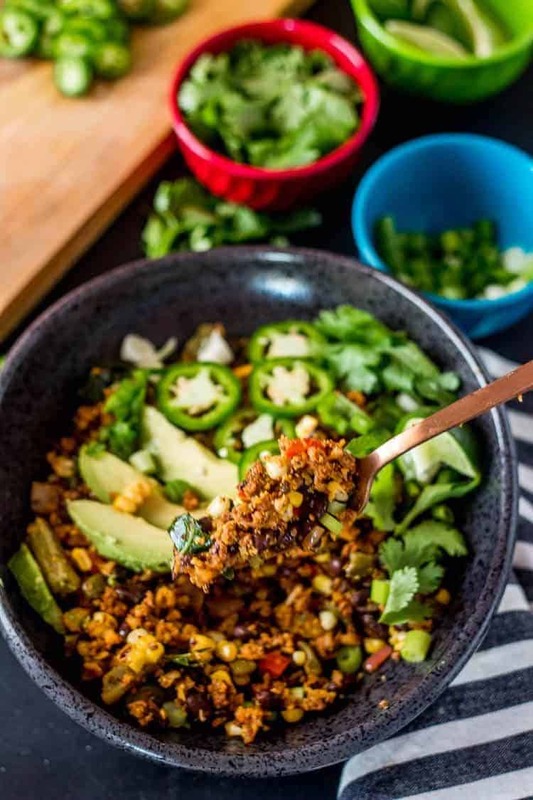 Grilled corn makes a great addition to this dish, but I tend to use whatever I have on hand at the time that goes with the overall flavor profile. If I don’t have any fresh corn to grill, I might consider adding frozen, but it would be missing the charred kernels that add an additional layer of flavor. Remember, we’re layering flavors and textures! If you’re cooking for carnivores, my favorite addition is the lean chicken chorizo I get at my local Sprouts market. The flavor is fantastic with all the other ingredients, and it is extremely low fat. You could add shrimp or diced chicken (though I’ve not tried it). The key to Low Carb Mexican Cauliflower Rice Bowls is in the prep work. While the cauliflower “rice” is roasting, prep the rest of the dish. With these specific ingredients, I parboil the chaya, and give the nopales a few minutes in a very hot pan to rid them of the cactus goo (mucilage). Grill the corn (if you’re doing it), and slice, dice, or chop everything that needs it. So, I’m curious. 😯 Have you tried (or even seen) chaya and/or nopales? If not, keep an eye open for them. 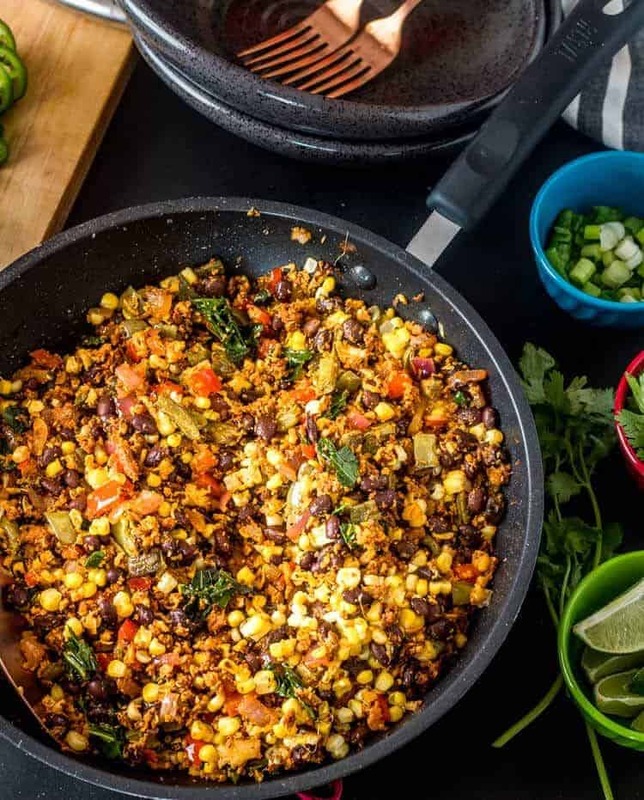 Latin foods are becoming more widely available! Preheat oven to 400° (375 convection). 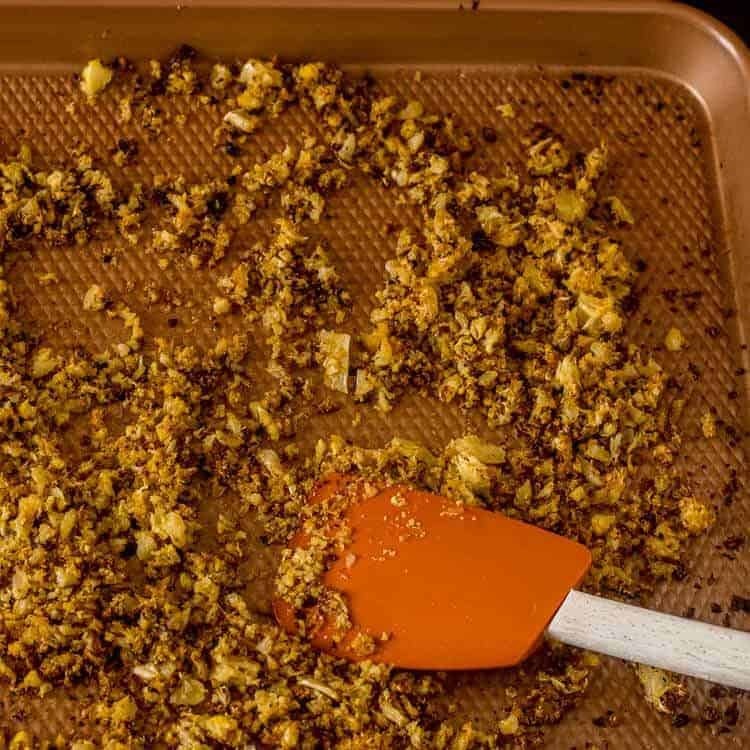 Spread the prepared cauliflower in a thin layer on a baking sheet. Drizzle lightly with olive oil, and sprinkle with sea salt and pepper. Place in oven. Stir after about 5 minutes, and every 5 minutes until you have a lot of golden brown (not all). Set aside. While cauliflower roasts, proceed. If grilling the corn, get it on the grill. When it has some char, remove the foil to allow it to cool, then cut it from the cob. Set aside. If using frozen corn, rinse (to thaw), and set aside. 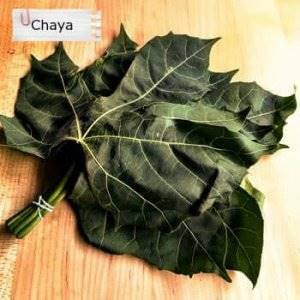 Prep the chaya. Remove stems, and boil leaves 10 minutes. Rinse, drain, and chop. Set aside. (See notes if using kale). If using nopales, add them to a large sauté pan coated with cooking spray. Stir-fry them over medium-high heat until you have browned edges and the mucilage has evaporated. Set aside. 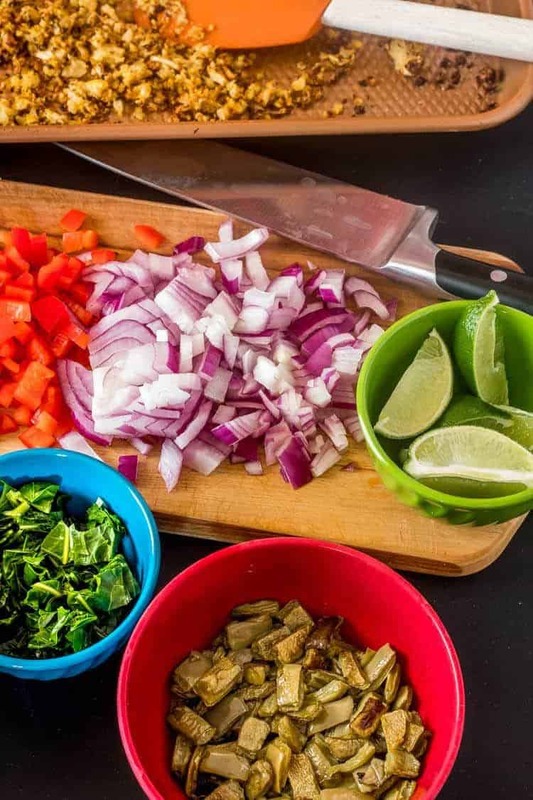 Go ahead and prep your garnishes, chop the onion and bell pepper, and rinse and drain the black beans. Once all components are ready, you can begin making the fried cauliflower "rice!" Using the same pan wiped clean, add the chorizo (if using), keeping in mind that lean chorizo like my chicken chorizo needs either some cooking spray or a drizzle of coconut oil or olive oil. Break it up. When it's mostly cooked, add the onion, garlic, and cumin. When the onion is soft and transparent, add the bell pepper, black beans, corn, nopales, and chaya (or substitutes). Stir-fry for an addition 2-3 minutes. Add in the roasted cauliflower "rice." Stir until everything is heated through. Taste for seasoning! To serve: Plate the Mexican Cauliflower Rice (I like my shallow bowls for this). Garnish with your choice of toppings. Enjoy! I use a food processor, and do the cauliflower in small batches. I pulse about 4-6 times until I have fairly uniform rice-sized pieces. If using kale in place of chaya, treat it the same. Cut off the stems, boil 10 minutes to tenderize, rinse, drain, chop. As I mention in the post, nopales may not be available (or something you want to try 😀 ). I should mention most Latino products sections have them in a jar. If you find them packed in water (not pickled), they're another good option. You'd probably love Hatch green chile or roasted poblanos. I would also suggest piquillo or other roasted peppers. Macronutrients (approximation from MyFitnessPal.com): 453 calories; 29 g protein; 11 g fat; 67 g carbohydrates. Note: This recipe has a lot of variables. To get the macros for this, I used Whole Foods bulk turkey chorizo (I use Sprouts lean chicken chorizo but no info available), and entered chaya leaves and nopales. I didn't include any garnishes. While 67 g carbohydrates isn't considered super low carb, it would be much higher with rice!